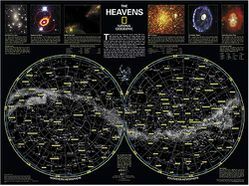 The Heavens Star Chart poster by National Geographic shows the constellations in both the northern and southern hemispheres. A variety of symbols are used to indicate star magnitude or brightness. The constellation patterns are outlined with a thin red line and identified by name. All 2,844 of the stars on the chart, plus nebulae and star clusters, can be seen with the unaided eye!